January 24, 2011: Call it a stunner. 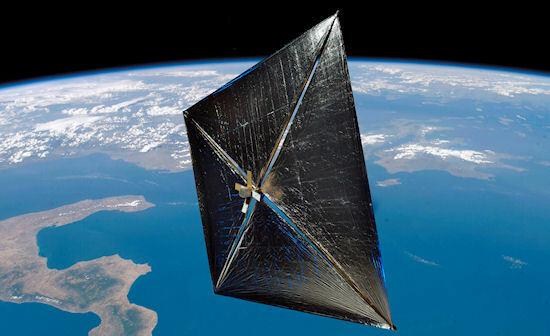 In an unexpected reversal of fortune, NASA's NanoSail-D spacecraft has unfurled a gleaming sheet of space-age fabric 650 km above Earth, becoming the first-ever solar sail to circle our planet. "We're solar sailing!" says NanoSail-D principal investigator Dean Alhorn of the Marshall Space Flight Center in Huntsville, AL. "This is a momentous achievement." NanoSail-D spent the previous month and a half stuck inside its mothership, the Fast, Affordable, Science and Technology SATellite (FASTSAT). FASTSAT was launched in November 2010 with NanoSail-D and five other experiments onboard. High above Earth, a spring was supposed to push the breadbox-sized probe into an orbit of its own with room to unfurl a sail. But when the big moment arrived, NanoSail-D got stuck. "We couldn't get out of FASTSAT," says Alhorn. 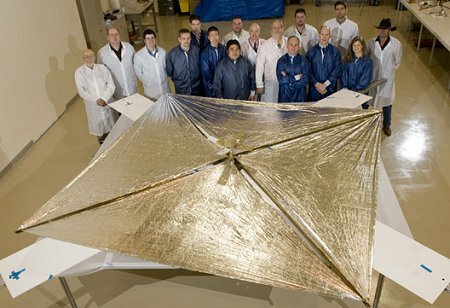 "It was heart-wrenching—yet another failure in the long and troubled history of solar sails." Team members began to give up hope as weeks went by and NanoSail-D remained stubbornly and inexplicably onboard. The mission seemed to be over before it even began. And then came Jan. 17th. For reasons engineers still don't fully understand, NanoSail-D spontaneously ejected itself. 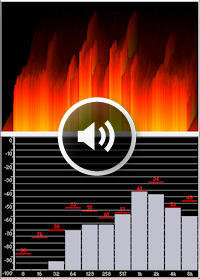 When Alhorn walked into the control room and saw the telemetry on the screen, he says "I couldn't believe my eyes. Our spacecraft was flying free!" The team quickly enlisted amateur radio enthusiasts Alan Sieg and Stan Sims at the Marshal Space Flight Center to try to pick up NanoSail-D's radio beacon. "The timing could not have been better," says Sieg. "NanoSail-D was going to track right over Huntsville, and the chance to be the first ones to hear and decode the signal was irresistible." Right before 5pm CST, they heard a faint signal. As the spacecraft soared overhead, the signal grew stronger and the operators were able to decode the first packet. NanoSail-D was alive and well. "You could have scraped Dean off the ceiling. He was bouncing around like a new father," says Sieg. The biggest moment, however, was still to come. NanoSail-D had to actually unfurl its sail. This happened on Jan. 20th at 9 pm CST. Activated by an onboard timer, a wire burner cut the 50lb fishing line holding the spacecraft's panels closed; a second wire burner released the booms. Within seconds they unrolled, spreading a thin polymer sheet of reflective material into a 10 m2 sail. Only one spacecraft has done anything like this before: Japan's IKAROS probe deployed a solar sail in interplanetary space and used it to fly by Venus in 2010. IKAROS is using the pressure of sunlight as its primary means of propulsion—a landmark achievement, which has encouraged JAXA to plan a follow-up solar sail mission to Jupiter later this decade. NanoSail-D will remain closer to home. "Our mission is to circle Earth and investigate the possibility of using solar sails as a tool to de-orbit old satellites and space junk," explains Alhorn. "As the sail orbits our planet, it skims the top of our atmosphere and experiences aerodynamic drag. Eventually, this brings it down." Indeed, mission planners expect NanoSail-D to return to Earth, meteor-style, in 70 to 120 days. The NanoSail-D team gathered around their sail after a successful laboratory deployment test: movie. If this works, NanoSail-D could pave the way for a future clean-up of low-Earth orbit. Drag sails might become standard issue on future satellites. When a satellite's mission ends, it would deploy the sail and return to Earth via aerodynamic drag, harmlessly disintegrating in the atmosphere before it reaches the ground. Experts agree that something like this is required to prevent an exponential buildup of space junk around Earth. Alhorn and colleagues will be monitoring NanoSail-D in the months ahead to see how its orbit decays. They'd also like to measure the pressure of sunlight on the sail, although atmospheric drag could overwhelm that effect. No matter what happens next, NanoSail-D has already made history: It has demonstrated an elegant and inexpensive method for deploying sails and become the first sail to orbit Earth. Eventually, the team will diagnose the sail’s reluctance to leave FASTSAT—"and then we'll be batting a thousand," says Alhorn. A follow-up story on Science@NASA will explain how sky watchers can track and photograph NanoSail-D before it returns to Earth. Stay tuned for "Solar Sail Flares." Credits: "I am thrilled with the success of our partnership with NASA's Ames Research Center," adds Alhorn. "This project would not have been possible without their involvement and the support of the many other companies on our team. It was truly a team effort."